Baseball, apple pie, and John Wayne's steadfast allegiance to America — these are symbols that bring to mind a sense of pride and a touch of nostalgia. What better way to pay homage to this great nation this summer than by celebrating with the Duke? 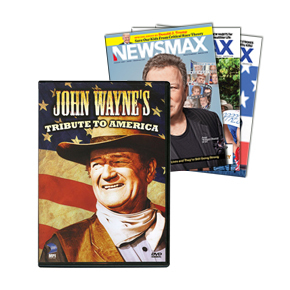 As an amazing time capsule of all-star entertainment, John Wayne's Tribute to America provides a humorous and heartfelt snapshot of a country we once knew — and hope to one day know again. In his special program, first aired on NBC in 1970, Wayne offered viewers a patriotic and poignant journey through American history — with music, comedy and many famous friends. You'll laugh yourself to tears, good tears! And what would any American tribute be without an uplifting musical soundtrack? And of course, "God Bless America" — by the entire cast! Challenge yourself not to sing along! John Wayne's Tribute to America is a welcome trip down memory lane, a nostalgic reminder of the patriotic spirit we once knew, and a message of hope that we may one day recapture the greatness of our beloved country.